How does your family use the area? Is the Kitchen used only to prepare meals and snacks or is it a gathering place for friends and family. When determining the layout of your Kitchen it is important to remember functionality. Your refrigerator sink and stove/oven should be in close proximity for ease of use when cooking . If you are into entertaining you want to create an open layout that allows several people to be in the space at the same time. You may also want multiple prep or staging areas. This can be accomplished with islands as in the picture below. 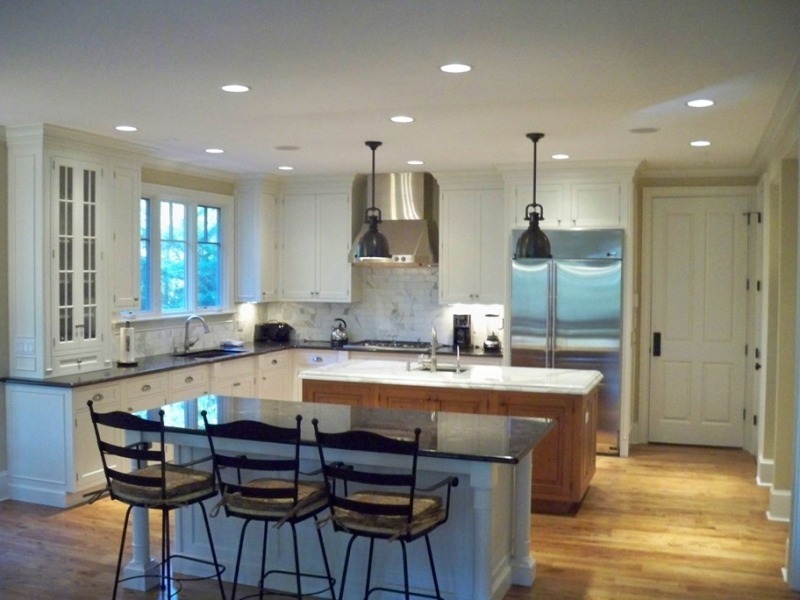 There are a wide range of choices when it comes to cabinets and counter tops. When selecting cabinets you can choose between “stock cabinets” and “custom cabinets”. Stock cabinets are less expensive and only come in certain sizes. There are usually several door style to choose from and they are a great option when trying to keep the budget down. Custom Cabinets offer a wide range of options and can be built to almost any size to fit your space. They offer many more door styles with a wider range of finishes. When selecting counter tops you should consider selecting a product that resist scratches and stains while also being an attractive design element. Granite is currently the most popular upgrade for counters but it does require occasional sealing to prevent staining. Flooring is not only a design element of kitchens but it is also a functionality element. Tile is the most user friendly flooring selection for kitchens. It is durable and easy to clean.